I cooked! Some days I feel way too tired, or my shoulder is too sore or whatever bug is going around is creeping up on me and I just can’t get it together to cook. I’ve been relying on our weekly boxes for creative food ideas lately, but I got a little creative today. 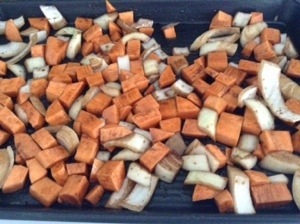 I started with a sweet potato and half an onion. I diced the potato, coated both in a little sesame oil and balsamic and roasted them at 400 for about 25-30 minutes. 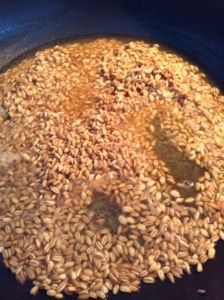 Meanwhile, I took about 3/4 cup farro, toasted it in some sesame oil then deglazed the pan in a shot of white wine. Then I cooked the farro in a risotto style – slowly adding warm vegetable stock and letting it cook into the farro before adding the next round of stock. 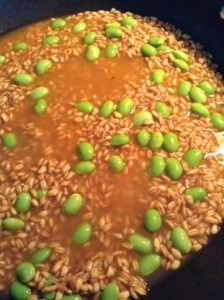 Towards the end of cooking the farro, I added some edamame and let it cook with the risotto. Once the farro was cooked, I stirred in the sweet potato and onion, then added about a cup of really finely shredded cheese. If condensed down, it would probably be about a half cup. I used the Swiss we had left from our last visit to the cheese shop and mixed it all together. The final result was a really flavorful, slightly salty dinner that was packed with texture. 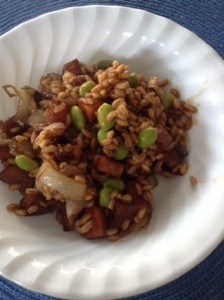 The farro had a nice bite to it and the edamame are probably the one bean I don’t have too much of a texture issue with. Bob didn’t mind that this dish was sans meat, but that would be one of my favorite parts of it. 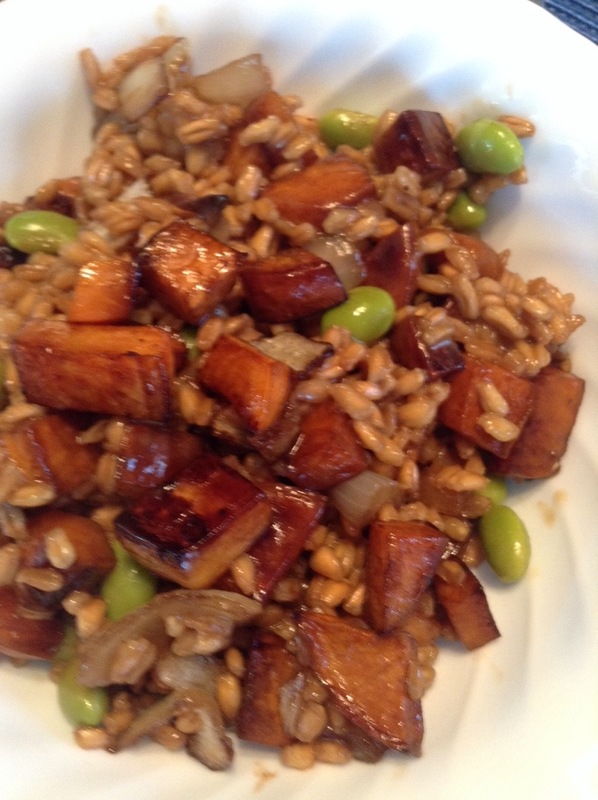 It could improve a little with a traditional cooking if the farro and adding some pumpkin seeds or chopped nuts. 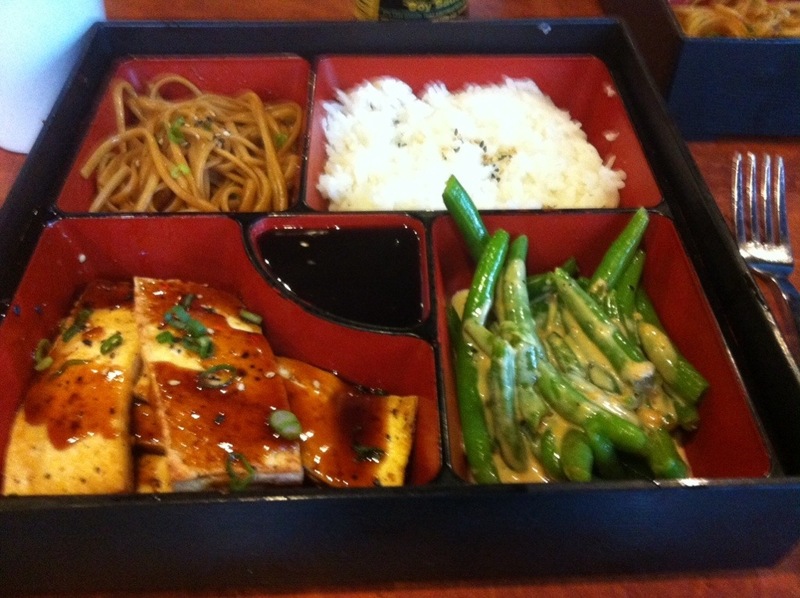 But overall, I loved this dish. After thinking last week was the cheese box week (and being wrong) Bob and I had a nice mini cheese night last week with the Winnimere, the Midnight Moon and the Scharfe Maxx. 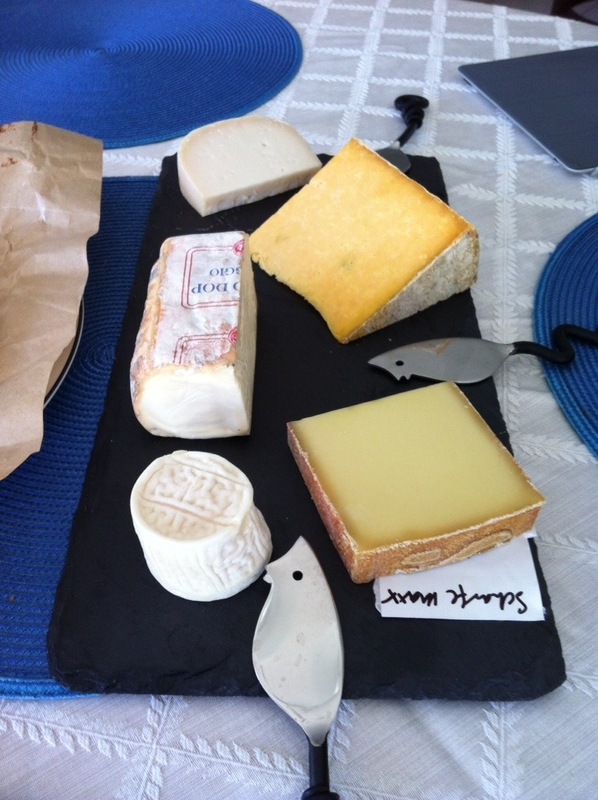 This week we added the actual cheese box cheeses, had a few people over, and made a mini party out of it. When I picked up the box on Friday, Louise did tell me we had a substitution since the regular box had a blue cheese in it. I’m not complaining in the least, but Bob would have liked a taste of the blue. I’m pretty certain the Bijou, a Vermont goat, was the substitution. I like this cheese. 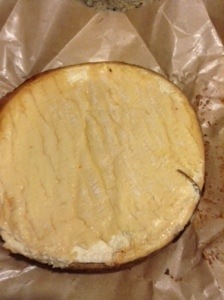 It is a classic, mild goat cheese. Soft and pairs well without being overpowered or overpowering. In addition to the Bijou we had an a English Cheshire. It looks like cheddar, but is so mild in flavor with a crumbly texture and a pretty orange color, I can imagine cooking with this one more than eating it plain. I may need to make grilled cheese or macaroni and cheese tomorrow to use it up. It did go well with some fig preserve I picked up, but while good, it was not on my must have again list. The clear favorite of the night, by everyone, was the Taleggio. Soft Italian cheese that was creamy, smooth and had a ton of subtile flavor. It is not a hit you in the face cheese, like the Winnimere, or a tangy cheese like the Midnight Moon, but it is something I’m going to look for again. It was so good, I had more of it for dinner tonight. Just cheese and crackers and I’m a happy little girl. Since we were having company, I also made dessert. I found a recipe for a flourless chocolate cake that looked incredible. 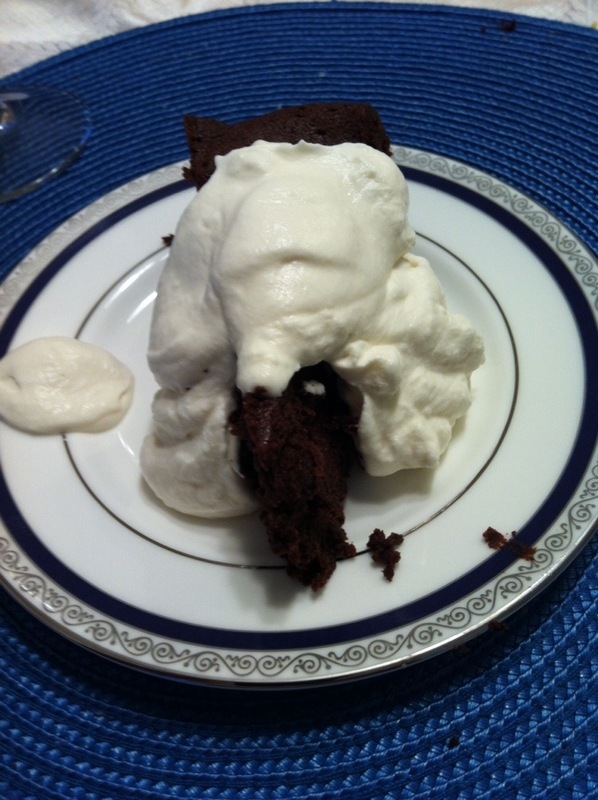 The original recipe calls for a chocolate meringue to top it, but I went with basic whipped cream. The cake was good, but not great. I forgot my major problem with flourless cakes – the texture. 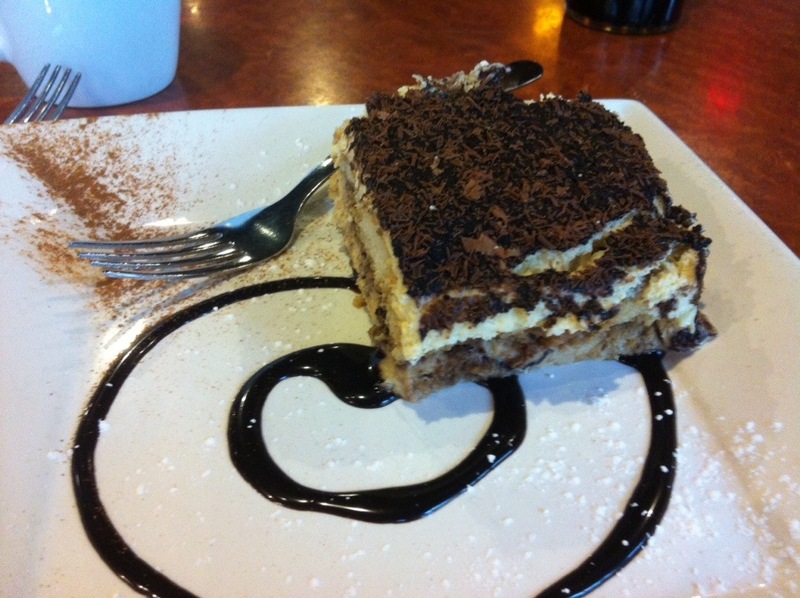 They tend to be crumbly and slightly dry and this one was no different. I ate my whole piece, and I think the cream was a good choice, but the Belgium brownie it was not. I brought Tigger home Friday too. Poor baby did not like the car ride home from Mom’s and he cried and cried and tried to get out of the carrier for the whole trip home. Jessie was glad to have him back, and he has been nice to Gracie since returning, but he is a little disconcerted at the moment. He also looks a little beaten up as his nose is scraped from his attempts to unzip the carrier with it, and it is a little black and blue. I’ve been trying to baby him a little and I think he had forgiven me for putting him in the car, but we shall see how long the good behavior lasts. Hopefully a long time. Yes, it’s a cheese post; no, it’s not the February Cheese Post. That should be this weekend. But … I did stop by the cheese shop this past weekend thinking it was the cheese box week and because Bob wanted to try a particular cheese from the newsletter. 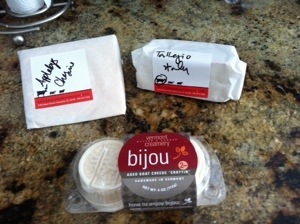 (Yes, we get a newsletter from our local cheese shop in addition to our monthly cheese box, but hey – it’s a hobby.) The description was fascinating and slightly weird and Bob actually asked me to pick up a round. Before I did, I read a review or two and fully admit I was a little uncertain. 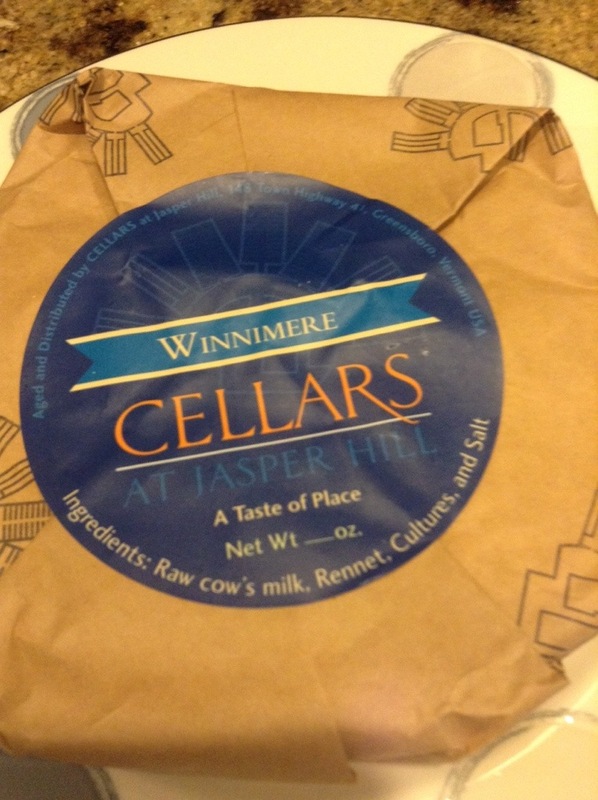 So, bright and early Saturday morning, after the farmer’s market Mom and I stopped by (thus discovering my inability to correctly read a newsletter or calendar before coffee) the cheese shop to pick up a round of Winnimere. First, let me say this cheese is heavy. It is larger than two people would need and I hesitated just a touch when I realized you can’t split the round. (Clearly the coffee had kicked in) but Bob specifically asked for it, and it was washed in beer, so okay, I’ll get it. 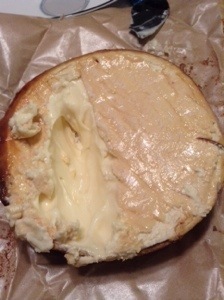 As a treat for myself I got more Midnight Moon, which is my favorite cheese, and one more to round out our cheese night. and gave it a go. I have to admit it was really, really good. Unless I got the rind – that was pure beer bitter to me so I just did not like that part. Bob did. He gushed over the cheese. All through dinner and even after. He raved, and gushed and ate lots of cheese. We are saving some for this weekend – we are having a few people over for the cheese box night this weekend so we are kind of excited. 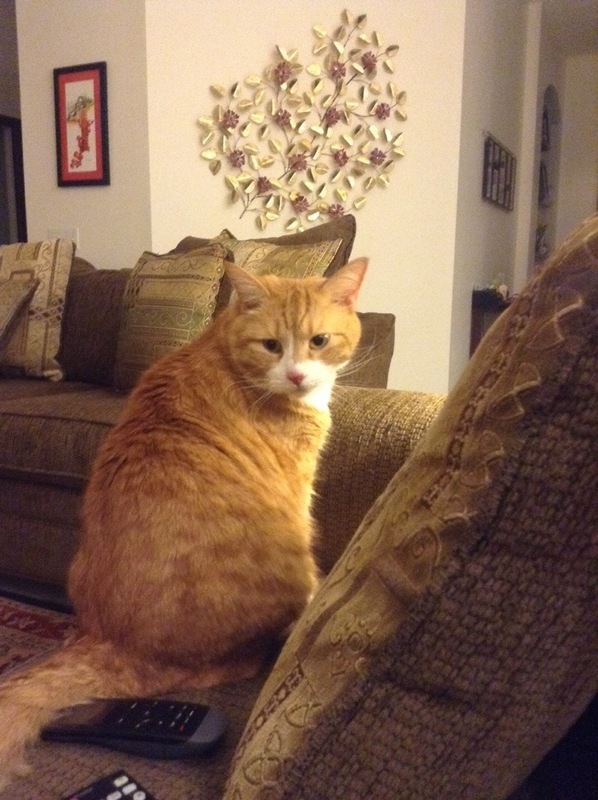 On a side note, I took a Tigger to Mom’s this week. Temporarily. The last week or two he has gotten really bad with Gracie. What was an every now and then pouncing turned into five days in a row of him going after Gracie, pouncing on her and rolling her. Monday she was favoring her back leg and then he went after her while she was hanging out on the back patio Tuesday morning (and managed to bend the screen door just enough to make it difficult to open). So … I asked Mom and Dad if he could visit with them for a few days. I made sure he had everything he needed (although I did forget to bring a bed for him) and plopped him in the carrier and into the car. If anyone remembers any of the vet stories, or the story of driving from Jersey to Florida with him will know he does not like cars. I did record him for a few minutes, but it is painful! You would think I was torturing him. In his mind a car ride is torture so I still feel bad. But Gracie needs a break and if I take her to Mom and Dad’s I’m afraid he will just get worse when she comes back. He’s fine. Mom assures me he is okay and not totally hiding halfway under the couch (he didn’t exactly fit totally under it). I’ll bring him home soon, but for right now, the girls are enjoying the break – especially Gracie. I, of course, feel like the worst pet mother ever, giving her “child” up, but I know it is temporary and necessary. 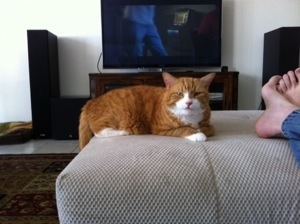 And Val assured me if Mom and a Dad do keep Tigger, she has another orange kitty I can have. A lot of times I find multiple recipes and combine them with changes based on what I have in the house. This time, I found a recipe and flat out stole it. I follow a couple of food blogs and My Favorite Pastime is one of the good ones. Now the original recipe did call for ham, but I left that out. 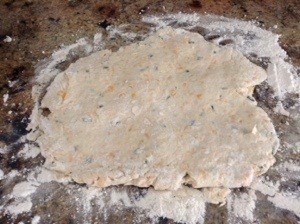 I started with cheddar and chives, flour, butter and buttermilk. I think my favorite part of this was mixing it with my hands. 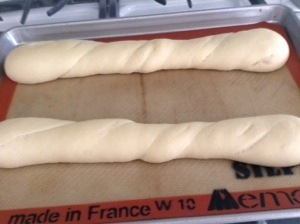 I rolled out the dough, cut them up and baked them. They were fantastic. 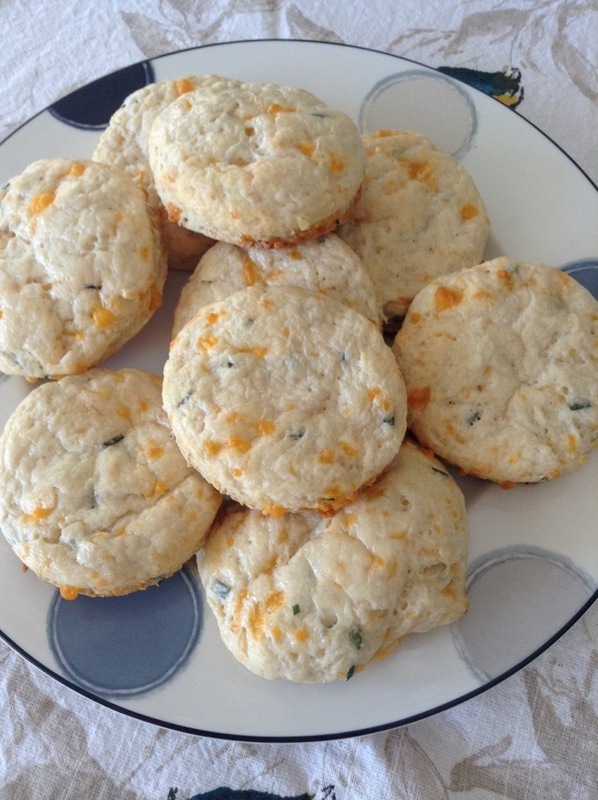 To go with these I made Potato Leek soup. I tried a different version than the typical creamy soup, and I always trust an Emeril recipe. I was skeptical at first because of the beef stock in this, and I didn’t have chicken stock and I totally forgot the thyme and cream. But I have to say, it worked. It was a nice, light soup that was also very filling. This combination really worked. 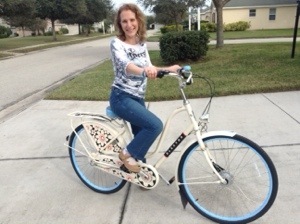 On a totally non-food note, I took my pretty bicycle to the grocery store today. It was really a nice ride down, but I had issues getting home. Bob rigged a milk crate to the back and it worked pretty well except for corners. So … He had to come pick up the groceries so I could ride home. The eggs didn’t make it, but everything else was fine. I just need to get my basket for the back before I take it to the grocery again. 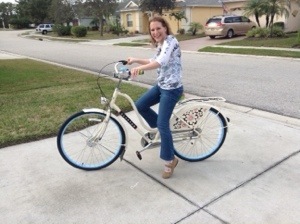 When I moved to Florida five years ago, I told Bob I wanted a bike to go to the grocery store. The grocery is two, maybe two and a half, miles down the road. In either direction as it happens. 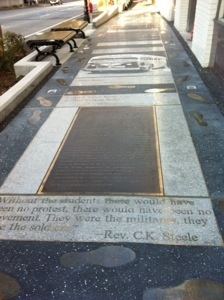 Just a little too far to walk with groceries, but it generally feels like a waste to take the car. I’ve talked about getting a bicycle, I’ve looked at bicycles and finally, I bought a bicycle. We have a great little bIcycle shop down the road. I started this year off by looking at their website and going through the bikes from manufactures they carry. Some were just way more than I wanted. $8000 bike anyone? Not me. I didn’t want anything with power assist or twenty gears, I wanted a basic, cute bicycle for grocery runs. I found one that I thought was adorable. It is called the Amsterdam. By a company named Electra. They designed it as a commuter bike and made it reminiscent of the bikes in Europe. They have a very basic line, a very top of the line line, and a ‘fashion’ line. You can tell which one I went with. I fell in love with the look of this bicycle on the website so we stopped by the shop a few weeks ago to see if they carried it. They didn’t have it in stock so I looked at a few others. 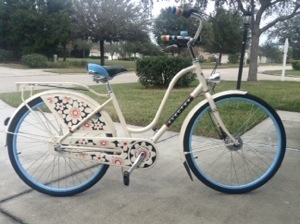 I came close to going with a different bike from the same company, but as soon as I looked at the picture if the pretty flowered bicycle, I just decided to get the one I really liked. After all. If I’m going to be riding it every week, I might as well be happy with it. 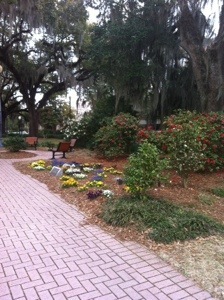 Bob and I went out to lunch today and we stopped by to pick up the bicycle while we were out. I saw it as soon as I walked in the store and it looks better in person than it did in the picture. My basket isn’t in yet. Yep, I got a wicker saddle bag basket for the back for groceries. Welcome back to 1900. The gentleman at the store told us he sold two more with mine sitting there. Apparently they used to stock one or two, but they didn’t move fast, so they stopped. But, with mine on the store floor for two days (I wasn’t riding home on the bike in the rain at dusk, I have a little more common sense than that) they sold two. I was happy to hear that. 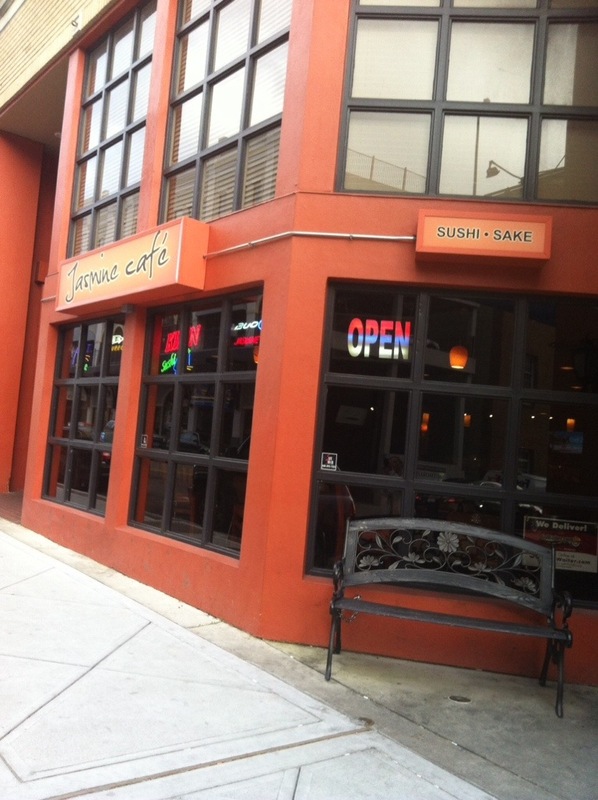 Support local businesses! It has been two decades since I rode a bike. I use to ride my bike to and from the library for work in high school but have not ridden since. And the old saying really is true. 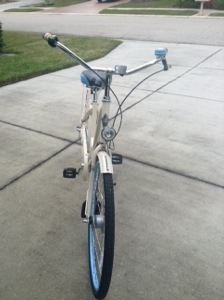 I hopped on, wobbled a little and rode home with full confidence and ease. I love my bike!